Articular or hyaline cartilage is the tissue lining the surface of the two bones in the knee joint. Cartilage helps the bones move smoothly against each other and can withstand the weight of the body during activities such as running and jumping. Articular cartilage does not have a direct blood supply to it, so it has less capacity to repair itself. Once the cartilage is torn it will not heal easily, and can lead to degeneration of the articular surface, leading to development of osteoarthritis. Patients with articular cartilage damage experience symptoms such as joint pain, swelling, stiffness, and a decrease in range of motion of the knee. Damaged cartilage needs to be replaced with healthy cartilage, and the procedure is known as cartilage replacement. 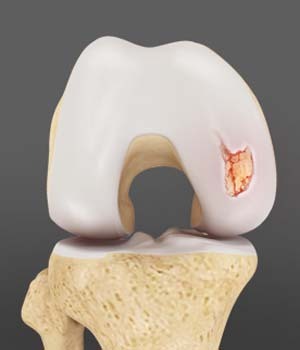 It is a surgical procedure performed to replace the worn-out cartilage and is usually performed to treat patients with small areas of cartilage damage usually caused by sports or traumatic injuries. It is not indicated for those patients who have advanced arthritis of knee.